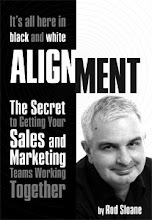 Sales and Marketing Alignment Blog from Rod Sloane: Can your business survive without email? I have been having email problems this month, software falling over, lost messages and a large amount of wasted, frustrating time. At it’s worst earlier this week I was in effect without an email service. But I survived. It’s easy really. Rather than email I sent a text message. Rather than emailing me, people called me. Somehow being without email, brought me closer to those who I wanted to make contact with and those who wanted to contact me. So could you get by without email? Would you thrive or crumble? I’m fully back on email now. if you promote an email address (via the cotnact page) on your site www.rodsloane.com and it fails due to being unavailable. Then you tell em to use a different one isntead via a DM on twitter.